You can message more than one person at a time on Facebook. Doing so creates a new conversation among all the people you message. Everyone can see and reply to the message. 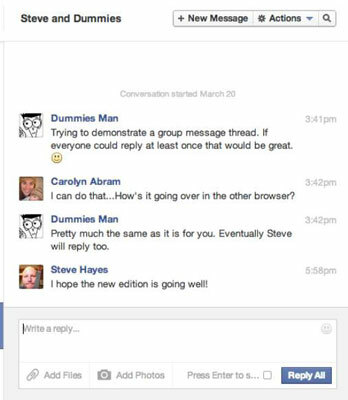 So if you send a message to Mike, Jenny, and Steve, a new conversation is created. When you’re looking at that conversation, you can see all the messages that have been sent by all the people involved. Much like the individual conversation, you can read this exchange from top to bottom, with the most recent message appearing at the bottom of the page. You can scroll up to read earlier messages. Below the most recent message is a box for replying. The main thing to remember about group conversations is that you cannot reply individually to members of the conversation. When you reply, all members of the conversation see your reply. You can see who said what by looking at the names and profile pictures identifying each message. Each message is separated and has a timestamp so you can see when it was sent. At the top of the page, just like with a one-on-one conversation, is the New Message button, the Actions button with a drop-down list, and a Search button for searching through the content of the conversation. Create Group: If you find yourself talking with the same set of people all the time, you may want to create a group for a richer set of options for sharing. Groups make it easier to share and talk about things like links and documents. Add People: If you feel that someone has been left out of the conversation, or if you suddenly realize he should be part of the conversation, choose this option to add him. You’re asked to enter the name(s) or e-mail(s) of the person you want to add. The person added can see the entire conversation history, even though he wasn’t added until the middle of the conversation. Leave Conversation: If a conversation isn’t interesting to you anymore, choose this option to leave it. If you do leave a conversation, the other people on the thread will see a small notice that you have left.